A small aisleless C13 church with renewed marble shafting in the chancel. It is now used as offices. The Pallant (possibly a corruption of Palatine), the south east quadrant of the city, was a separate jurisdiction under the Archbishop of Canterbury, who held much land in the area and also the advowson of All Saints. It is the only church in Chichester mentioned in Domesday Book (2, 5), though as part of the Archbishop’s estate of Pagham and not by name. The modest church of galletted flint is C13. It has a nave and chancel with no chancel arch and lancets. The large west one has been altered, for the Sharpe collection drawing (1805 or 1805?) shows one that was significantly wider with a slight ogee in the head, though no other detail is clear. The three east ones have shafted rere-arches of dark marble, within in a single larger arch and in their present state they date from 1842, though they are said (Hills p121) to be based on what was found of the C13 east end. 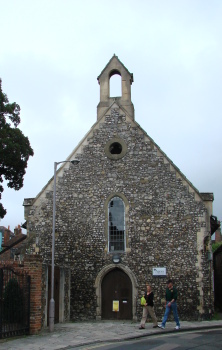 Similar shafting in churches around Chichester is associated with the cathedral, so its presence here is plausible. The other lancets are simpler and less repaired; the side ones in the chancel are set close together. The north west one is smaller and at the south west corner is a blocked C13 moulded doorway. This corner was cut away at a date subsequent to the Sharpe drawing to make more space in the street outside. The moulded west doorway is C15. There were several Post-Reformation changes. The east window before 1842 was a rude ‘modern’ one (ibid) and there was a west gallery, probably late C18 or early C19, which was still there in 1946 (Leeney (SAC 86) p183). The Sharpe drawing shows a belfry which was a larger version of that at St Olave with a similar spirelet, but in 1842 this was replaced by a stone bellcote (WSRO Par 36/8/2). In turn, this was replaced by a similar one at a further restoration in 1904, of which only the mason, Henry Edwen Steel of Emsworth, is recorded (WSRO Par 36/4/2). It is now rather forlorn as its bell is missing. Fleming dates the plastering on the roofs at between 1890 and 1921 (p23) and there is a vestry, entered through a C19 double arch. All Saints ceased to be used as a church in 1971 and became for over 30 years offices for the Red Cross. During this time, the interior was divided up with a lower ceiling and the walls were painted, including the few monuments. It is now used by a private company. Piscina: (South side) C13 trefoil-headed.